1. Base type: E27. 2. Input voltage: 85 ~ 240VAC. 3. Full range of colors: cool white, warm white, blue, green, red, yellow. 4. Superior thermal management with internal copper heat conductor and external aluminum housing. 5. Light source: 10 Watt high power led. 6. Luminous flux: 400 lumens. 7. Beam angle: 50 / 70 / 100 degrees ( glass lens, optical grade). 8. Body temperature: less than 53 degree celius. 9. 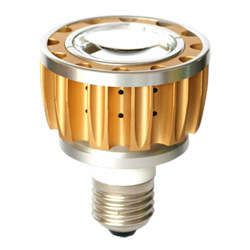 Led working temperature: less than 62 degree celius. 10. Temperature: -40 ~ 70 celsius degree. 11. Brightness degradation: 3% - 5%1kh. 12. Life span: 50, 000 hours. 13. No uv or ir radiation. 14. Certifications: CE & ROHS.